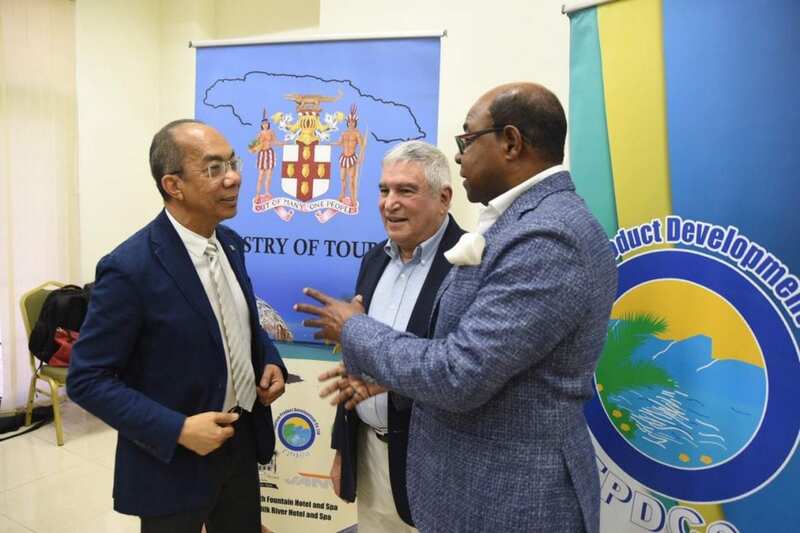 Minister of Tourism, Honourable Edmund Bartlett (R) in discussion with Minister of National Security, Hon Dr. Horace Chang (L) and Dr. Peter Tarlow, International Tourism Security expert. The occasion was the initial briefing with Dr. Tarlow and senior members of the Ministry of Tourism and its agencies, held at the Montego Bay Convention Centre, regarding the island wide security audit of the sector. The security audit is being carried out by the Tourism Product Development Company. Jamaica Tourism Minister Hon. Edmund Bartlett has reiterated Jamaica’s commitment to creating a new way forward and architecture as it relates to visitor safety and security. This follows a meeting with international tourism security expert, Dr. Peter Tarlow, Minister of National Security, Hon Dr. Horace Chang and senior members of the Ministry of Tourism and its agencies. Dr. Peter Tarlow is part of the new eTN Travel & Tourism Safety Program. Certified for Safety is a partnership between Dr. Peter Tarlow’s company, Tourism & More, Inc. and the eTN Group. Tourism and More has been working for over 2 decades with hotels, tourism-oriented cities and countries, and both public and private security officers and police in the field of tourism security. Dr. Tarlow is a world-renowned expert in the field of tourism security and safety. He leads the eTN Travel Security and Safety Training team. For more information, visit travelsecuritytraining.com.